Update April 2018: I wrote the post below in Aug 2017 and it has not happened yet, however, new rumors are circulating again. Bottom line: transfer your points to your main account (i.e. the Reserve) monthly “just in case.” It doesn’t take more than a couple of minutes. If you read the post yesterday about Chase limiting you to one Sapphire product (with no notice, mind you), you may be wondering what might be next. It’s clear that they are trying to cut costs on the Sapphire product line and as much as I hate them saying you can’t have a Chase Sapphire Reserve if you have a Preferred and vice versa, you can see why they did it. There’s really no reason to have both and that costs them the signup bonus. Recently there was talk that Chase was considering limiting how you can combine points from multiple accounts into your Reserve. Perhaps points from a Chase Freedom or Freedom Unlimited (maybe also the Business Preferred) would not be transferable to the Reserve where you can use at 1.5x on travel and also transfer out to airlines and hotels. You can kind of see why, as when people earn 1.5% UR on the Freedom Unlimited or 5% on the Chase Freedom during the rotating bonus categories and transfer to their Reserve, they are getting 2.25% cash back and 7.5% cash back respectively. So my recommendation is to combine your points now and then every time a statement closes on your non-Reserve account you should move them to the Reserve that day. Just login to your account and at the top right where you see your balance, click Combine Pints. Enter your Reserve account # there and click Combine. You can do the same in a Business account. I suggest this as my hunch is they won’t retroactively remove or limit points already in your Reserve account, but you may not have a warning on a change when and if it happens. I also still think it’s a good idea to grab the Chase Ink Business Preferred card now and nab those 80,000 bonus points while you can. 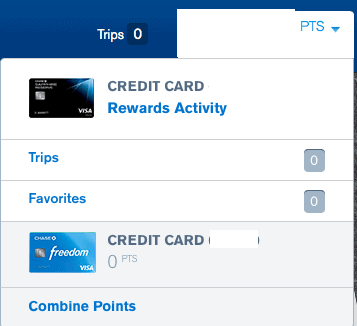 I won’t be surprised by Chase making some changes to the Chase Sapphire Reserve, but I think the ability to combine points is a pretty standard aspect of credit card points… Citi lets you do it. Amex does it for you automatically. The ability to combine points earned from the Freedom isn’t going to be what saves Chase significant amounts of money. Even with quarterly 5X points, it’s limited to $1,500 in spend and the vast majority of people with both a Freedom and CSR (or CSP) aren’t going to max out all four quarters. Most won’t max out any quarter. Hopefully, Chase can force themselves to think beyond today and consider the long-term. This is an interesting development. When Chase wanted to be the Amex Platinum slayer they gleefully rolled out the CSR, basking in the limelight of their success. They loved the attention that the media heaped upon them. And now they are worried about the financial implications of their actions? It seems to me that Chase should have done a better job with their demographics. Most of the bloggers hailed Chase as the God of all Points. I wonder if they will still do that a month from now?